John R. Duffett, 88, devoted husband of Joan K. Duffett for 58 years and the son of the late S. Lester and Esther Fisher Duffett passed away peacefully in his sleep on Saturday, December 1st, 2018. John was born in Somerville, Massachusetts on July 7, 1930 and was always quick to tell a story of his New England roots specifically of Massachusetts, Maine, and New Hampshire. Nothing was more important to him than family. Along with his parents, he could spin a tale about his vast memories of his elder brother, Henry, and sisters, Emma and Jane, just about quicker than someone could yell his favorite cheer, “Go Dawgs”. He was the sole surviving sibling from his generation and leaves his sister-in-law, Virginia (Henry), and Joan to serve as historian’s ad libitum for the Duffett legacy. John’s collegiate career started at Bates College in Lewiston, Maine where he attended less than a half a year, but one that was a part of most of his stories and the root of some lifelong friendships. John attended North Carolina State University where he obtained a Bachelor’s and a Master’s degree in Mechanical Engineering and Textile Manufacturing. While at NC State, he was an active fraternity member of Lambda Chi Alpha Fraternity and was a collegiate letterman in Tennis. It was at NC State where his love for tennis was fulfilled, but this became a lifelong passion through his support for the UGA Tennis Program and his avid support for all things NCAA Tennis when it was hosted in Athens. John enlisted in the Navy where he graduated from the Supply Corps School in Athens, Georgia and attained the rank of LTJG and served as a Supply Officer. After the Navy, John married the love of his life, Joan Kinnaman, to whom he was married for over 58 years. John joined E.I DuPont in one of several jobs in a career that spanned nearly thirty years across Kentucky, Tennessee, Connecticut, and Georgia. At DuPont, he was a pioneer in the field of textiles and was one of the initial process developers of the indestructible product named Corfam. After retirement from E.I. DuPont in the 1980’s, John took on a job with the University of Georgia that he retired from nearly twenty years later. It was at this job where he became known as “Mr. John” to all of the co-eds that he would meet on campus as well other names that he would be called for the parking violations issued in his early years with Parking Services at the UGA Bookstore. John was a student, a veteran, an engineer, a devoted husband, father, grandfather, community servant, and a good listener….as long as you agreed to listen to his stories. When he gets to the pearly gates, we are comforted that he will be met in short order by his childhood dog, Socks, his first dog with Joan, Dagmar, followed by a procession of basset hounds named Fred, Claude, and Otto and his final two dogs, both named Pooh, but with different ranks – one being an Admiral and the other a Colonel. There was not a dog in the world that disliked John – well, perhaps the one that bit him and his son (different days) when house hunting for what ended up being the family home for +40 years in Watkinsville, Georgia. For those that knew John, many knew him to be a seemingly affable man with a sense of humor that was usually self-deprecating and as large as his tall frame would allow. For others that knew him on the various community projects he worked across Oconee County, Northwest Woods, and Watkinsville, they found him to be steadfast for what he thought was right. In all cases, he dealt with people with politeness, professionalism, and etiquette that was respected by friend and foe alike while maintaining some degree of governance around growth, education, and the community at large. It remains to be seen, but as a family, we all remain hopeful that none of his grandkids will adopt his keen fashion sense consisting of plaids, stripes, solids, oversized red caps, and a ‘SpongeBob’ tie for occasional flare. Fashion has taken a tremendous blow with his passing. John is survived by his wife and three children and their respective families, Bob Duffett (Birmingham, Alabama), Warren (Janet) Duffett (Columbus, Indiana), and Debbie (Evert) Duin (Auburn, Alabama) and his eight grandkids and one great granddaughter. He considered his greatest accomplishment to be his relationship with his grandsons and granddaughters and each of their abundant futures. Bob’s family consists of John’s grandsons Matt, Brian, and granddaughter Kimberly Duffett. Warren’s family consists of grandsons Dan Kinnett, Taylor Kinnett, and Bryce Duffett. Debbie’s family consists of grandsons Tom and Will Duin. Dan has his sole great granddaughter, Georgia Suzanne Kinnett. There is little doubt but that each will grow up telling their own memories of times when G-Pa / Grandpa sat them down to answer the question, “what are you going to do in the future?”. In lieu of flowers, the family would request that donations be made to The Ark, United Ministry Outreach Center, 640A Barber Street, Athens, Georgia 30601. The Ark is where both Joan and John devoted many hours of volunteering to provide help and hope to families in/around Athens, Georgia struggling with financial emergencies. 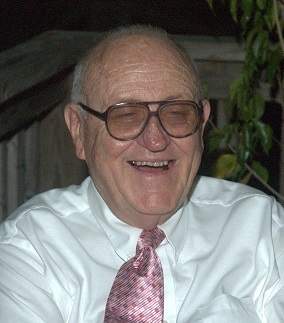 The celebration of life for John R. Duffett will be held at 2 pm (EST) on Saturday the 15th of December 2018 at the First Presbyterian Church, 185 West Hancock Avenue, Athens, Georgia 30601. A reception and visitation with family will be held in the reception hall after the ceremony. After the spring thaw in Maine, John’s ashes will be interred in Lewiston, Maine at a family plot near his beloved Bates College.